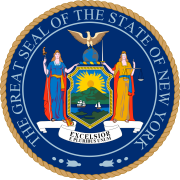 The New York Attorney General election is held every four years. Electoral history results that are easily accessible and that date back to 1855 in these elections can be found, online, at Our Campaigns. All data on these elections can be verified at Our Campaigns. 51.23% Franklin D. Roosevelt, Jr. The 2006 election was held on November 7. Andrew Cuomo was elected to replace incumbent Eliot Spitzer who successfully ran for governor. The 2010 election was held on November 2, 2010. Eric Schneiderman was elected to replace incumbent Andrew Cuomo who successfully ran for governor. ^ a b Attorney General - History, Our Campaigns, Retrieved 8 January 2014.